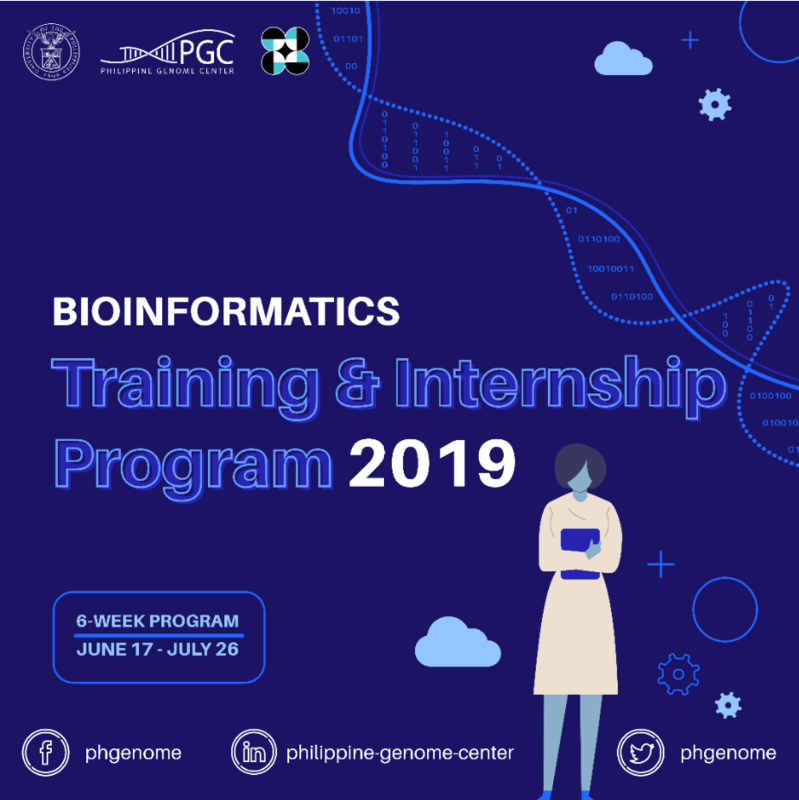 The Philippine Genome Center (PGC) is inviting Filipino college students and young professionals (citizens and permanent residents of the Philippines) in science and engineering for an internship program in bioinformatics. Student applicants must be incoming senior BS students or graduate students in good academic standing, enrolled in a science or engineering course at an accredited college or university. Young professional applicants must have a BS degree in a science or engineering field, and be a researcher and/or faculty member employed at a research or higher education institution in the Philippines. Accepted interns will receive training in introductory biology, genomics, and bioinformatics, and gain supervised, hands-on experience doing research or infrastructure development on real bioinformatics projects. A fixed stipend of ₱23,000 will be provided to help cover travel and living expenses over the six-week internship. All applicants are requested to provide a copy of their curriculum vitae, as well as a letter of motivation, to be submitted through the form linked below. Graduate students and young professionals must in addition provide a brief, one-page proposal for a bioinformatics project, relating to their current work or area of interest. The deadline for application is May 17, 2019, and accepted applicants will be notified on May 24, 2019. For further inquiries, email us at [email protected] or call us at 981-8500 loc 4706. PGC’s Core Facility for Bioinformatics started as a capability-building project funded by the Philippine Council for Industry, Energy & Emerging Technology Research and Development (PCIEERD). Since its public launch in April 2014, it has been servicing researchers in Next Generation Sequence (NGS) data analysis, providing technical support, and giving training courses to further increase local competency in bioinformatics. Besides commissioned/in-house training programs for researchers, the bioinformatics team has been training undergraduate students through an annual internship program, now in its third year, to further increase the local talent pool in bioinformatics. The Bioinformatics Training and Internship Program, expanded thanks to a grant by the Department of Science and Technology, is a 6-week program that provides interns with an opportunity to hone and develop their bioinformatics knowledge and practical skills in a collaborative and multidisciplinary environment. This year, the Core Facility for Bioinformatics welcomes incoming senior BS students as well as graduate students and young professionals in biology, molecular biology, mathematics, statistics, computer science, and related fields, particularly those who are keen on pursuing research careers in bioinformatics and computational biology. Accepted applicants will receive training in introductory biology, genomics, and bioinformatics; and will be working on projects related to research or infrastructure development in bioinformatics or computational biology. The internship program will be held on June 17 to July 26, 2019 at the 2nd floor, Left Wing, Philippine Genome Center Building, A. Ma. Regidor St., University of the Philippines, Diliman, Quezon City. Interested individuals from public and private colleges, universities, and research institutions in the Philippines are invited to apply. A stipend will be provided to help cover travel and living expenses.